I was just pointed out the memory controller is a difference. Regardless, an HBM/HMC stack is guaranteed to be more expensive which is the point I was trying to make. The L4 cache you are thinking of was a lot more than just a ram chip on the pcb, it had a whole extra concurrent memory controller and used 1/4 of the L3 cache as L4 tags. The cache without the controller and tags isn't the same. It would just be some mismatched ram. Zen 2 is getting that I/O chiplet. And a good amount of L3. Maybe there is some way they can work doubling ram channels and controllers and keep them straight with that stuff. Lowering Ryzen's ram latency to less than Intel's would be good for gaming. I don't know where you get less power usage? It will still consume the same amount of power. The board cleaner is objective, it will increase the pin count, by alot. CPUs will be massive, have you not seen how many chips it takes to make 11gbs on the 2080ti? Multiply that by 3, or 6 lol. And this will 100% be bad for memory manufacturer's. Do you think every one of them is going to get a contract? Lol, no. So just like with GPUs, 1 or 2 will get a contract, of which they will barely be able to keep up supply's, prices will rise and the other manufacturer's will suffer from no business until the next shot at a contract. If this actually happens, which I think you guys are overthinking it, I think it will be like a L4 cache, not full on system memory. It will be bad for everyone. What about OEMs? Now they are supposed to have what 50 CPU skews? Mobos are supposed to make 50 boards? They can't be the same sized chips. So now we need a i3, in 4gb, 8gb, 16gb, and then in i5 in 4-32, i7 4-64, plus all the different models of those? Now we have I9s to add too. Then for us overclockers, rip that, the heat will be extreme. CPU blocks massive. This will not simplify or improve anything, it will things worse. Then there is right to repair. Ram sticks die, alot. So what happens when some of the ram, overheated by the CPU dies, 1 day after warranty, on a 2000 dollar CPU? Ya let's hope for that case. Last edited by Cyber Locc; 03-19-2019 at 12:52 AM. Components closer together require less power to communicate, as you need less voltage to accomplish the same task. See: Every Node shrink. Stacking RAM on the CPU would reduce board pin count and complexity. See: Any HBM based GPU. There are only three DRAM manufacturers these days. Hynix, Samsung, and Micron. AMD has no problem working with Hynix and Samsung to make HBM, no reason Micron could not except they're working with Intel on HBC. There are actually more than two GPU companies. ARM, Broadcom, Qualcomm, and Apple all make their own GPUs. They just do not make what you would consider to be a performance GPU. L4 cache has proven to be effective in Broadwell-C. I agree that it will be L4 as it will be near impossible to put enough RAM on the chip to satisfy all needs, but I disagree that L4 is bad for "everyone". They can be the same sized chips. AMD wants to do 3D stacking, and that means putting the RAM on top of the IO die. The socket will not change between models, just like the "socket" did not change between 16GB Vega FE and 8GB Vega. DDR4/HBM RAM does not make much heat or use much power. Almost all our RAM could be run without a heat sink if we wanted to, they just look nice. As long as RAM speeds are decoupled from the core speeds, there would be zero change in how you overclock today. Have you ever actually seen a TR4 chip? Not that it matters, larger blocks just means more surface area and less thermal density. That is a good thing for overclocking, not a bad thing. It will improve plenty, or they would not bother to implement it. RAM never dies in the grand scheme of things. In the last five years over 5000 replaced/disposed assets spanning the last 8 model generations back to the Core 2 Duo/DDR2 through 8000-series on DDR4 and with over 6000 active assets in use with an average of 1.5 sticks per PC, both laptops and desktops, I have seen exactly three RAM stick deaths. In comparison I have seen over a thousand HDD failures and a few hundred PSU failures as cause of "death". I have never seen a CPU fail. MB failures were maybe a few dozen, but almost always user damage. The RAM would not be overheated by the CPU. RAM is capable of running at 80C+ just like a CPU can, and the RAM temp would never be higher than the CPU temp, so it literally can not die that way as the CPU would throttle itself before hitting dangerous limits. Once again, I will point you to Fury/Vega, which put out far more power than AMD's CPUs do and have no problems doing so. Last edited by KyadCK; 03-19-2019 at 06:35 AM. AMD is only going to make 1 IO chip die, just like they oly make 1 core die. So there will be 8 memory channels in the IO die on both AM4 socket and the Epyc socket. They dont need to work on anything to fit more channels in, as they already have 8. The problem is that the AM4 socket cannot just magically get more memory channels. It does not have the pins to get any more channels out of the socket. So just like in the past, they will disable the unused channels. If AMD is going to use the stacked memory as actual system RAM then that would be a very bad choice. 1) it will run at AMD's actual supported memory speed which will mean any dimms you add in will have to match that same slow speed and timings. 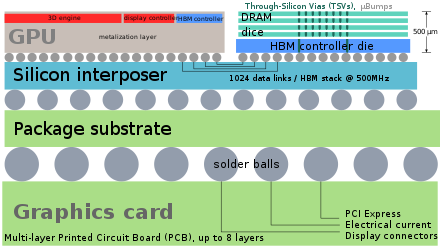 2) You need a lot of pins for memory so even if they are able to technically stack dozens of layers of transistors, you run into an actual limit of the number of traces you can run through the stack. AMD would have to significantly enlarge the IO die to use 8 channels on stacked memory to give us crazy channel counts on consumer socket with 32GB of RAM on board, so they could fit the traces through the stack and still have room for the actual memory cells. They will want to go smaller if anything which means even less space for traces to memory chips. So system memory just seems like a bad idea outside of laptops. Abetter idea is to use stacked memory cells as an L4 cache as others have said. Last edited by EniGma1987; 03-19-2019 at 07:48 AM. they'll just leave the unused channels blank, it'll operate in dual-channel mode, or quad-channel mode if AM4 is pinned to all 4dimm slots properly. but yes, there'd be issue if they just split the channels for on-package + off-package, the on-package ram would pull down the clock speed of the off-package ram. anyway, the best solution is to use the HBCC they developed for this, on-package dram has it's own cache controller. One "Core" chiplet (8c/16t), one "GPU" chiplet (1024-1280 shader-ish), one "I/O Die" chiplet with the usual dual-channel, but also with 2-4GB of HBM (single stack) on top to act as L4 eDRAM cache/VRAM like Broadwell-C, and add in HBCC for multi pool management. Give it 125-140w to go ham on desktop models. Finally after what feels like a decade, an APU that lives up to what HSA started. Also they want to do 3D stacking because consoles, which obviously would not upgrade RAM anyway. Selling what amounts to an entire PC on a chip would be good for them. I meant that AMD could use some of those unused channels for an on die edram like cache, and use some of that 16MB L3 for tags to sort what is on the on package dram so that can be used, and what isn't can be accessed from off package dram concurrently. I probably just stated it sloppily as I often do. You don't need pins for what isn't leaving the package. If they put in more edram modules, they could run even more concurrent L4 caches. It is really just wistful thinking. The odds they will use these bits in such a way, even when they are all so close together, are pretty insignificant. Edit: This is assuming that there are actually more than one memory controller on that I/O die. If there is just one with more channels, and it is not segmentable into differently configured modules, then my edram idea won't work and was based on a misunderstanding. Last edited by rluker5; 03-19-2019 at 10:22 AM. If it helps any, eDRAM on Broadwell added another $100 to msrp. Unlikely to be cost effective now either.